Diving in Canada from the East coast to the Great Lakes to the West and Northern Canada means diving in what is usually rather frigid conditions. The cold water (and sometimes weather) does not have to be a deterrent, however. 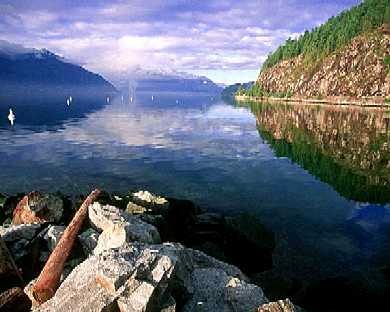 Canada is home to great dives sites with a wealth of biodiversity and history to be found in both fresh and salt water. Equipment considerations for cold or temperate water diving differ from what divers need or want for tropical diving. Exposure Protection is the most obvious equipment change to take into consideration when transitioning between tropical and cold water dives, but there is more to it than just drysuits or wetsuits although they are a huge part of it. We have several articles on how and why to choose drysuits and drysuit undergarments so we won’t rehash this subject too exhaustively here. More and more divers are recognizing the consequences of cold on the body, particularly regarding impaired decompression and are equipping themselves accordingly rather than “toughing it out”. This means that drysuits are becoming increasingly common in cold-temperate waters rather than being restricted to the most extreme conditions. There’s no line in the sand that can truly be drawn where we can say, “this is the temperature where wetsuits are no longer appropriate and drysuits with proper insulation must be used”. But in water that hovers around the 8 degree celsius mark all year long there are very few divers these days that suffer in wetsuits locally any longer. A good wetsuit or semi-dry is approaching the cost of an entry level drysuit. Not all temperate water diving requires drysuits, particularly moderate length, recreational dives. Our peers diving the St Lawrence and relatively shallow lakes (at least the ones that are not glacier fed) tell us about how warm the water gets even to depths of 60ft/18m or more. A good 7mm wetsuit (either one or two piece) or semi-dry suit will suffice in these conditions for those that opt not to dive dry. These days well made wetsuits are very comfortable, fairy stretchy and employ flat neoprene at ankles and wrists to minimize water exchange and gluing at seams for the same reason. What are semi-dry suits? Semi-dry suits traditionally have involved neoprene “seals” at the wrists and ankles and sometimes along the face as part of an attached hood that will greatly restrict water movement. They have tapped and/or glued seams as well, and often a bit of a neoprene “seal” under the zipper (which is not waterproof on its own). They are like suped-up wetsuits in that they allow some, but very little water in that remains trapped against the skin so the body can efficiently warm it and maintain that barrier of warmed water. They do not use a layer of air (or argon), like drysuits and thus do not require valves nor significantly alter a diver’s buoyancy control. Contemporary wetsuits have improved so dramatically that the difference between a good wetsuit and a semi-dry are almost negligible. Wetsuits like Bare’s Elastek are extremely flexible even in 7mm thicknesses. Exposure protection in cold and temperate water extends beyond drysuits and wetsuits. Gloves are an important part of exposure protection and always involve a little bit of a negotiation between dexterity, warmth, durability and price. Personally, I cannot imagine using anything but dry gloves for most of the year in our water. For short, shallow dives in summer, a good pair of 5mm neoprene wet gloves may be an adequate substitute, but to enjoy longer dives, or to dive when the water clarity is best in winter, dry gloves are the way to go. Different drysuits and/or wrist seals have different dry glove systems that they are compatible with. Like drysuits, dry gloves have come a long way in recent years. The new Si-Tech Antares system is used by several drysuit companies and available after market as well. They are quite reliable and the elliptical cuff offers less bulk on the wrist than the large round predecessors. The traditional Si-Tech system is still available and can be used with the heavy duty blue gloves and clamp system or with industrial strength rubber gloves stretched over the cuff ring on the suit. Both systems, depending upon method of installation, may provide divers with a user-replaceable inner wrist seal. Usually this seal is latex, but silicone seals are becoming increasingly available. DUI’s Zipgloves are my personal favourite and played a large part in my decision to stick with DUI suits when I purchased my latest suit. The Zip system is very reliable and allows divers to easily switch between latex seals, silicone seals or zip gloves. With the gloves installed these systems allow for air to move freely between the suit and the gloves, which helps keep the hands warmer than those with a seal between the body and the hands. Once again, are a part of your exposure protection that will depend, in part, on the type of suit that you’re using. Drysuits will have some sort of attached sock or boot to keep your feet dry. Some will be rigid or have rigid bottoms (like Flex Soles by Santi or Turbo Soles by DUI) and you’ll be able to safely and comfortably walk around in them as is. Others will simply be a sock, usually made out of neoprene or crushed neoprene. These socks are not intended to be walked on or to really be worn for diving without a boot over top like a Rock boot or Trek boot – they are very susceptible to wear. Boots worn over top of such socks mean divers are responsible for one more piece of equipment and do reduce ankle and foot flexibility while kicking to some extent. However, they do provide additional stability whilst traversing rocky terrain on shore. Wetsuit boots for cold water diving should be 5mm thick or thicker. Most divers opt for something with a zipper down the ankle to make them easier to don & doff. However, some prefer a boot without a zipper to minimize water exchange in order to stay a little warmer. This does significantly increase the effort required to get in and out of them. Boots will typically have a rubberized sole, although neoprene socks without such a sole are available in a variety of thicknesses, as well. Generally divers prefer a slightly flexible rubber sole that is not too bulky so that fins can still fit properly and so that they retain some flexibility for propulsion. Hoods are a critical piece of cold water dive equipment and admittedly my least favourite piece of dive gear. They come in many flavours. Typically 5mm is the minimum thickness for the neoprene around the head, though thicker hoods in 7mm, 9mm or 10mm varieties are available. A proper fitting hood in a comfortable, stretchy neoprene is key. Any hood that is too tight or restrictive due to poor fit can inhibit equalization and cause stress on the jaw which can become quite painful over the course of a dive. Hoods used with wetsuits should either be attached to the suit or a separate hood that can be tucked into the suit. There should not be any skin exposed! Drysuit hoods may be short and end part way down the neck or may be a little longer with a bit of a flange that can be tucked into “warm neck collars” of some suits – ensuring neoprene coverage over the entire neck. These will keep you warmer but may be harder to put on and take off. They may also make accessing your neck seal in case of emergence much more difficult. The amount of weight used for cold or temperate water diving can surprise warm water divers. Given the amount of thermal protection worn and it’s buoyancy characteristics, most divers in British Columbia are going to be wearing somewhere in the vicinity of 30lbs of lead. Because of the significant amount of weight that is worn, it is important to distribute it appropriately. 30lbs of weight on a weight belt is not only uncomfortable, but it makes trim (and therefore buoyancy) difficult to control and can be a safety hazard. Imagine accidentally losing 30lbs of lead at depth due to a weight belt slipping off or being accidentally released. Weighting systems ideally are moderately comfortable on the surface and practical underwater. Weight distribution should help divers attain trim position, therefore systems that have several variations are best as each diver is going to have different needs in this regard due to factors such as body composition, thermal protection and the buoyancy characteristics of other gear used. Weight integrated BCDs that usually allow for divers’ to break up weight distribution over 2 or 4 pockets are a popular way to begin weight distribution. Other systems like backplates and wings have negative buoyancy characteristics built into the system. We will look more at these in the next section. Other weight distribution strategies include diving with a steel cylinder, which is more negatively buoyant than an aluminum cylinder (how much so depends on the type and size of each), using a weight harness system (like DUI’s), fins that are negatively buoyant (especially popular with drysuit use to counteract floaty feet), v-weights for double tank systems and a variety of other methods. Weight belts don’t necessarily disappear entirely from the equation, but if used, it is best to opt for a small denomination here such as 8lbs. I am, to be perfectly honest, biased on this subject. I am a long time user of a backplate and wing. I’ve tried numerous other varieties of BCDs and owned a couple and there is nothing else that I have any desire to use. So, admittedly, that colours my perspective on this topic. That being said, it may be most logical to begin with why I like backplate and wings. I find them particularly excellent options in cold water diving, but equally versatile and well performing in warm water. First of all, as mentioned above, a backplate and wing system generally allows divers multiple options when it comes to distributing various amounts of weight across the BCD. The plate itself can be made out of various materials and vary in thickness (within reason) and this will determine how negative it is. A standard stainless steel plate, for instance is usually approximately 6lbs negative whereas an aluminum plate will only be a pound or two negative and a thicker plate can weigh in at about 11-12lbs negatively buoyant. Choosing the right plate for you depends on how much weight a you need in total and where else you would like to carry it among other things. Other factors include height and gear configuration; for instance, those with shorter torsos may be limited to plates made specifically for their build. Carrying weight as part of the backplate streamlines a diver and moves ballast over top of a diver’s lungs which helps stabilize them and maintain a trim position all the way through a breathing cycle. The same advantages can be said about having a wing resting on a diver’s back rather than inflating around a diver like a jacket-style bcd. Most divers using these systems prefer the now common elliptical wing/bladder design as opposed to the once popular horseshoe design. This is because the elliptical wing and bladder allow for better air movement/less trapping and are thus easier to vent. This design also is more streamlined and keeps the bladder more within the diver’s slipstream. Because these systems are so modular, not only can you select a plate in different lengths and weights and bladders in different shapes, but you can opt for different sizes of bladder as well. Some of these vary to accommodate the extra width needed to accommodate double cylinders and some of them vary in lift capacity. It is common to find wings with approximately 30lbs of lift or less for warm water. These tend to be fairly compact. By contrast more lift is generally wanted for colder waters where we are wearing heavier equipment. Generally, 40lbs is plenty. Anything much greater than that in a single tank is just going to be excessive and result in air traveling through an oversized wing that will be more difficult to vent and create drag. Backplate and wings also are generally found with basic harness designs. Instead of the four or five sizes fit most philosophy behind most other bcds available, a harness with one continual piece of webbing can be sized specifically to the diver using it. This means that your bcd fits you well and prevents a lot of the rolling and twisting that occurs in slightly over-sized bcds. The backplate being a rigid platform for everything also minimizes this sensation and creates a much more stable experience in the water. In addition to improved fit and stability, a simple harness reduces bulk in front of the diver and therefore improves mobility and access to the important parts of dive equipment in the water, like a harness buckle, weights, a cutting device, pockets (on wetsuit or drysuit), lights, alternate second stage, etc.In cold water, when we are clad in thick wetsuits or drysuits and undergarments we are already struggling to maintain as much mobility as we can and having gear that minimizes clutter and restriction is key. Furthermore, this simple, but sturdy webbing is long-lasting with virtually no failure points when coupled with a stainless steel buckle. If/when the time comes to replace old webbing due to potential fraying or stiffness or damage, it is relatively inexpensive and easy to find unlike proprietary plastic snaps and buckles or velcro components commonly holding shoulder straps waist straps and chest straps together. Admittedly, the world of bcds does not begin and end with the backplate and wing. And that it just isn’t what everyone wants, needs or can invest in at the moment. So what else should one look for in a cold water bcd? Well, a lot of it is similar to what makes a backplate and wing desirable: cold water bcds should be robust enough to handle our environment and the weight of the gear they are supporting; they must have adequate life; should permit comfortable and safe weight distribution (weight integration that includes not just front pockets, but trim pockets as well, for instance); fit well and do this all without being excessively bulky or otherwise hindering a diver’s movements. Ideally weight distribution and bladder inflation will occur primarily behind a diver’s back so that the ballast is largely over the lungs and not pulling down the lower half of the body. Pockets are usually not terribly accessible when present on a bcd, particularly in cold water exposure protection and are best if they are minimalistic – if they are present at all – so that they do not impede the diver’s range of motion or ability to access other pieces of equipment such as lights, d-rings, etc. People are sometimes surprised to hear that there is a difference in what you need in a regulator for cold water. The most important feature that you are looking for in a regulator that makes it suitable for cold water diving is that it has an environmentally sealed first stage. This means that no water enters the first stage. This is important in cold water environments, because should very cold water enter, it can freeze up once inside the first stage and cause the regulator to freeze open and free flow. (If anyone ever wonders why they practice breathing from a freeflowing regulator in the Open Water course this is why.) Diaphragm regulators are often available in environmentally sealed models. Regulators for cold water are also often equipped with a heat synch where the second stage meets its low pressure hose. This means that as the air traveling through the regulator and hoses meets a restriction and its temperature drops, the heat synch utilizes its increased surface area which is in contact with the slightly warmer water to warm the internal components to prevent freezing. Often, regulator manufacturers will offer their highest performance regulators in environmentally sealed options, but they are usually available from middle of the road regs as well. As technology improves, the additional bulk necessary to house an environmentally sealed first stage decreases and many are very small and quite light and therefore travel friendly options as well as great cold water regs. These don’t vary much from warm to cold water environments but there are a few things to keep in mind. First of all, if you are using a computer to calculate your no-decompression time and/or your decompression obligations, you will want to ensure it is set to take into account the additional stress that cold water places on a diver’s body. Most computers offer a way to increase how conservative they are. This is prudent when diving in cold water and can typically be changed by the diver, but not usually between dives. If you are just using a depth gauge/bottom timer combination and planning your own dives according to tables or pc based deco programs then you will want to consider that we often will treat cold water dives as 10ft/3m deeper than they actually are in order to account for the extra cold water stress. Any gauges worn on the arm or wrist will need a strap or mount long enough to fit over exposure protection as opposed to a bare wrist or thin wetsuit. Prepare this ahead of time whether it is with an after market mount or the extension strap that many computers come with for this very reason. Standard straps often will NOT fit over drysuits, thick wetsuits or their gloves. What does water temperature have to do with scuba cylinders? Well, there are a couple things to keep in mind. First of all, in cold water we are using exposure protection that is significantly more buoyant than what is typically used in warm water. As discussed above, we must add more weight to our systems in order to counteract this. Aluminum 80s tend to be slightly positive when “empty” which adds to the amount of weight we must carry. However, steel tanks are more negative overall and remain negatively buoyant even when drained. This means divers can take some lead off their systems elsewhere. Depending upon the particular tanks used, this is not an insignificant amount either. Often divers can remove in excess of 5lbs of lead. Once again, this ballast being found in the tank places it on the back, over a diver’s lungs and helps square away trim and buoyancy as well as keeping the weight stable if secured properly to a well-fitting bcd. In cold water divers tend to go through their gas faster. Buoyancy changes are more noticeable and air must be added both to bcds and drysuits. Divers tend to work a bit harder underwater as well, both to move the bulk of the additional equipment through the water and to keep themselves warm and this means increased air consumption. Most divers find when moving from cool water to warm water a tank of air will last considerably longer in the warmer, more accommodating environment. So, once again, divers often prefer steel tanks with larger volumes of gas. There are several different options available and many things to consider, including weight of the tank and the size of the diver carrying it.